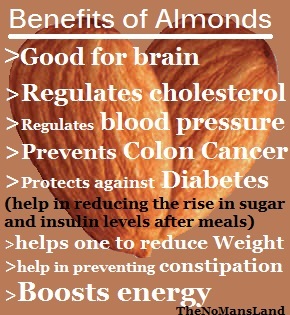 Almond are packed with full of nutrition so it is also known as SUPER NUT because of its highly nutritional value. If it is really lower the cholesterol, then how many almonds should eat if someone have high cholesterol? According to U.S Food and Drug Administration,one handful or about 23 nuts (shelled) is condidered a suitable amount that will be benefiacial to heart health . It is rich in monounsaturated fats.This fats help keep levels of Low-density lipoprotein or BAD CHOLESTEROL down. Also read here- Health benefits of Dry fruits-Raisins,Walnuts,Cashenuts etc..